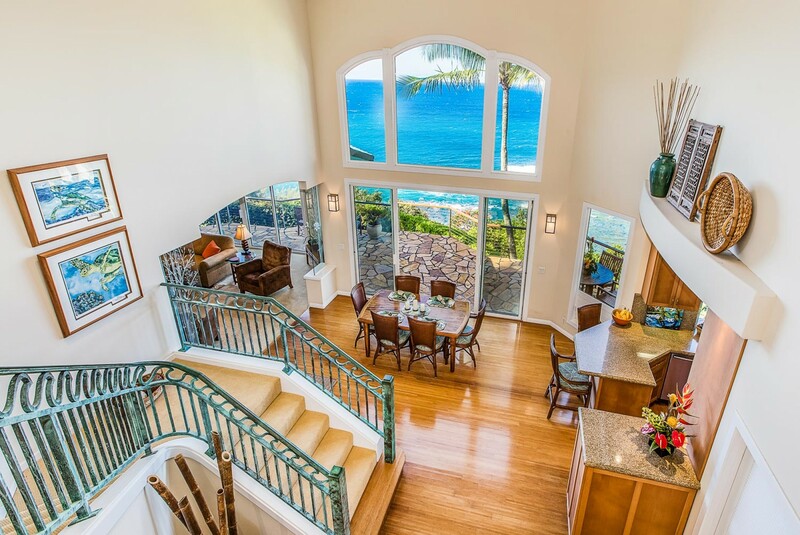 Welcome to Honu Awa a 4-bedroom luxury villa that is perched overlooking the panoramic views of the Pacific Ocean in Kauai, Hawaii. 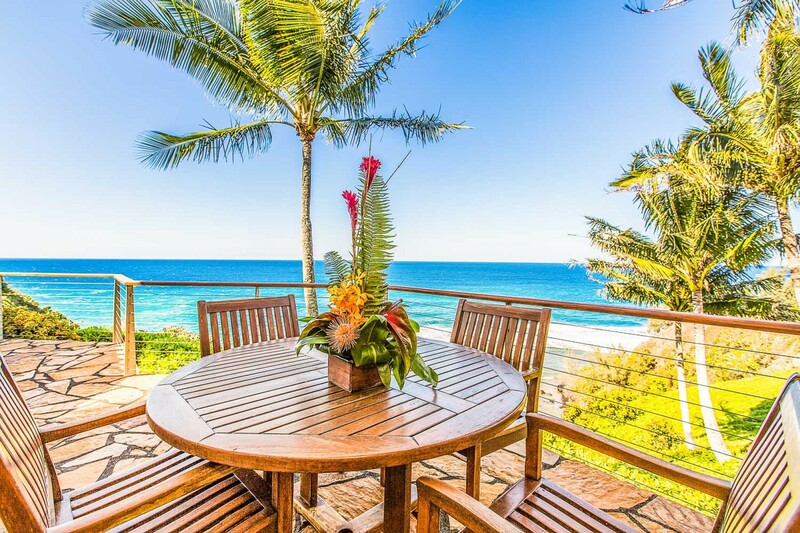 Specifically located along the coast of the Princeville area in north Kauai, this exceptional villa provides convenient access to renowned Hanalei Bay and is just a short drive from other breathtaking beaches like Lumahai and Anini. 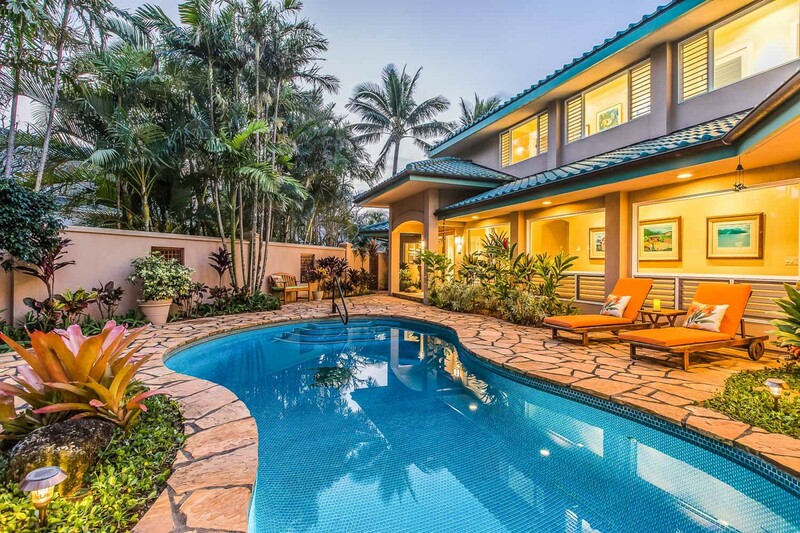 The villa can accommodate up to eight guests and is truly an exceptional home, with the finest of luxuries and features such as a private swimming pool, balconies, secluded terraces and enclosed tropical gardens. 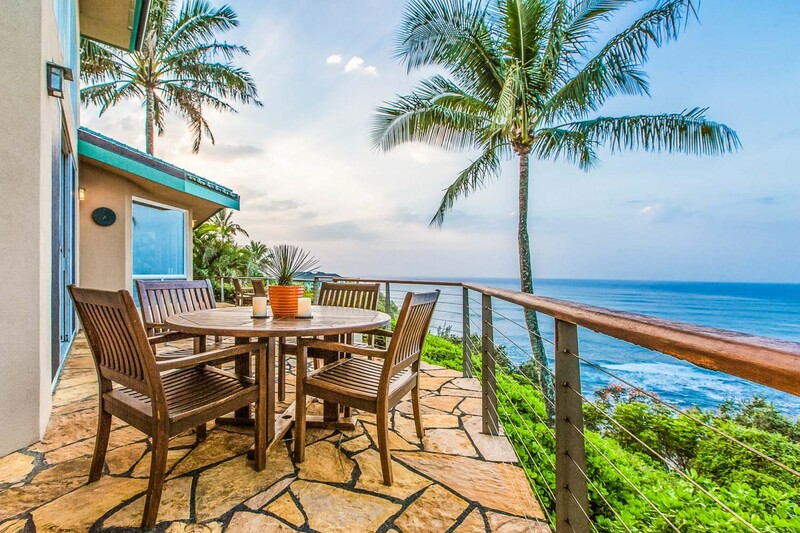 Honu Awa translates to ‘Turtle Cove’ in Hawaiian, this upscale home overlooking the north shore surf, a mesmerizing reef, and endless Pacific waters. The overall impression of the villa is captivating. The expansive outdoor living area is truly luxurious with its serene private lagoon-style swimming pool which can also be heated. Look out over the crystallized waters and slip into its warm embrace. Sit out in the secluded courtyard that is surrounded by lush tropical plants and read your favorite book as you let your worries float away. You can also lay out on the sunbeds and listen to the thymic waves as the dance below. 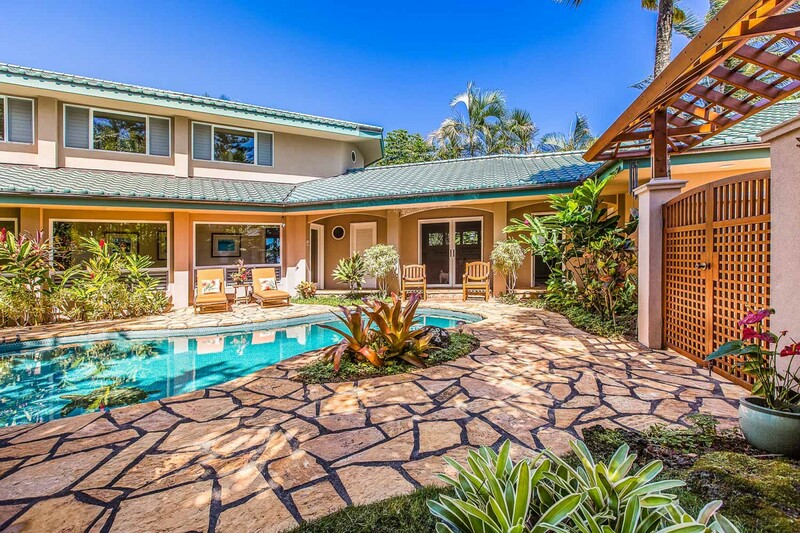 As the location of the villa is nestled in a quiet cul-de-sac, the property has full privacy and serenity. The outdoor living space comes with an alfresco dining area on one of the secluded balconies. 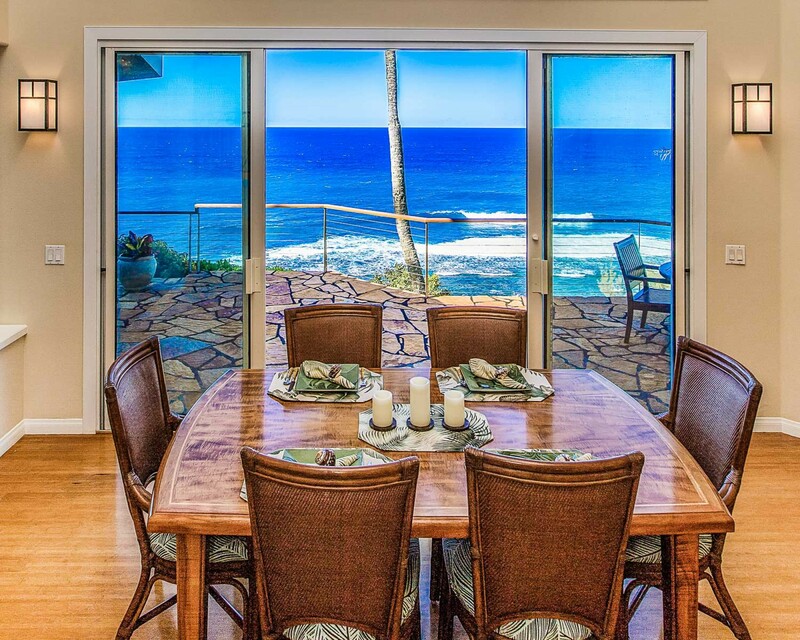 This seats up to four guests and overlooking the incredible sea views. 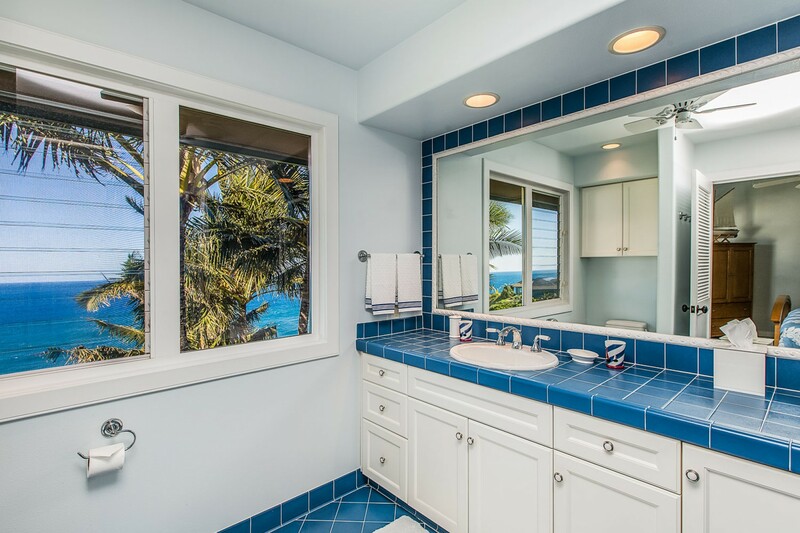 Perch yourself along the edge and look over the vast waters of the Pacific Oceans. 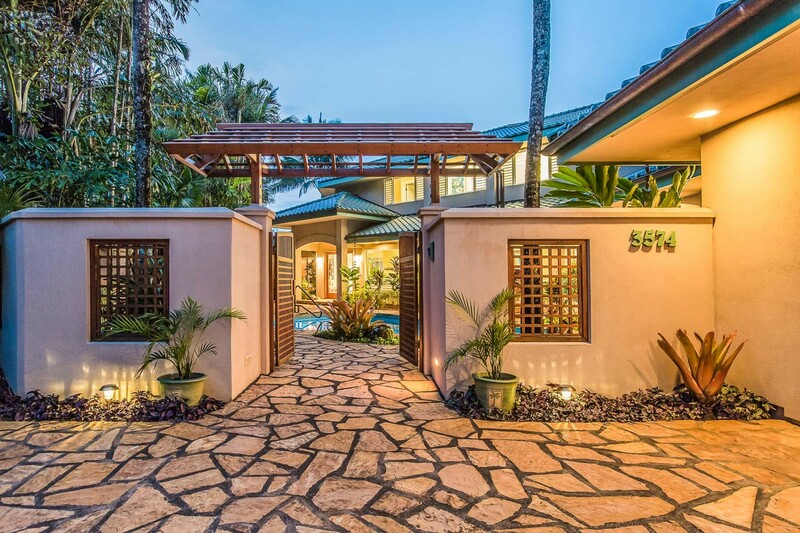 At the entrance of the property, there is a private parking area and a garage for you to use. The enclosed terrace is surrounded by vibrant tropical flowers and delicate plants that carry sweet smelling scents along the fresh Pacific air. 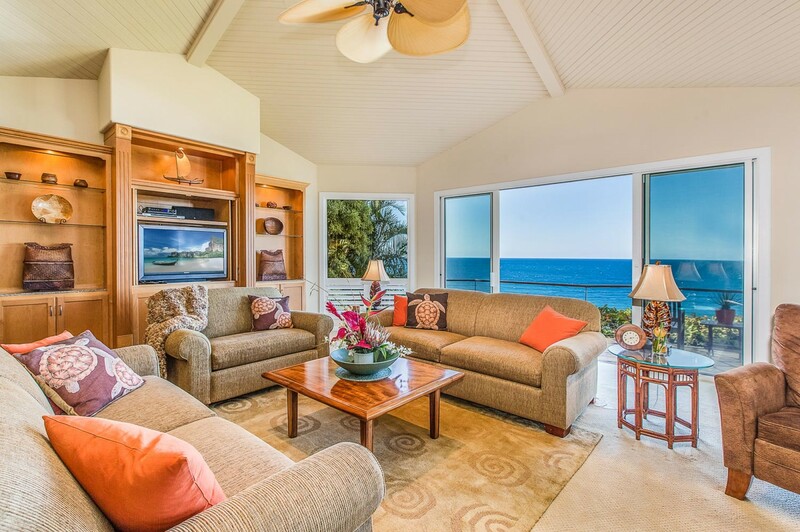 Honu Awa’s expansive lanais are fitted with comfortable outdoor seating with incredible privacy and Pacific views. Here you can sip your delicious morning coffee or enjoy an open-air candle-lit dinner. Delving into the details of the interiors, the villa embraces a very open design layout. 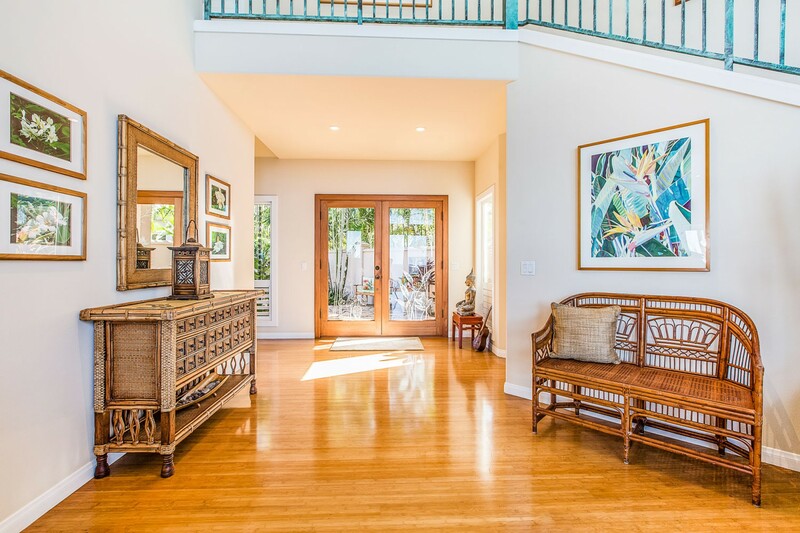 Relax in the refined comfort of the open-concept floor plan, where the well-appointed kitchen flows into the dining room, which in turn flows into the living space. The living space is fitted with elegant high-rise ceilings and the expansive windows flood the room with warmth and light. 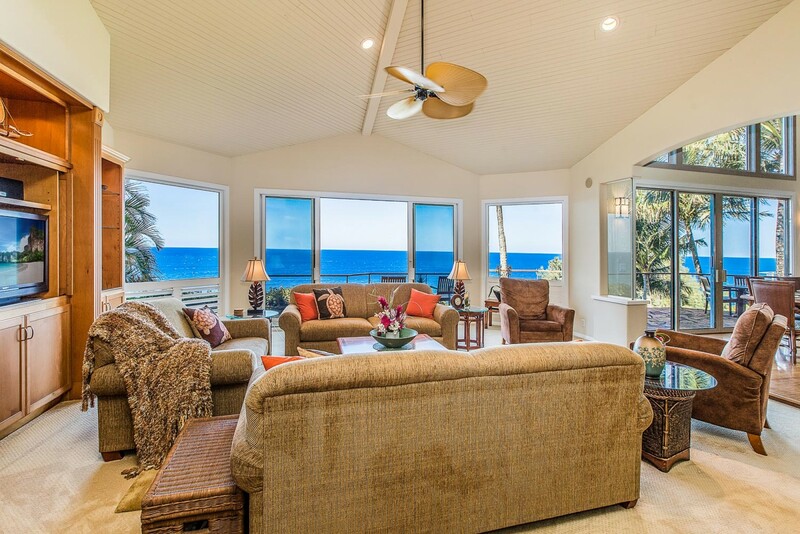 Open the doors and windows and allow the cool breeze to float through your home effortlessly. The space is fitted with plush sofas and a high-resolution Television. 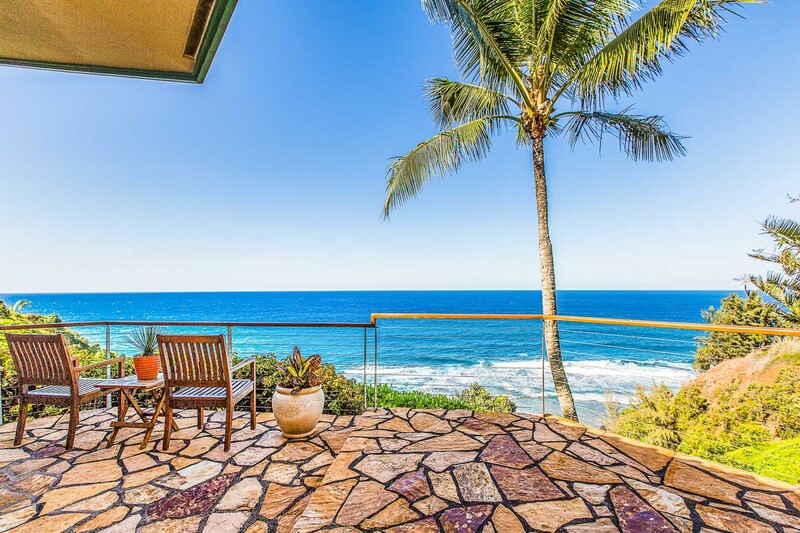 The room has exceptional sea views and has direct access to the private balcony. The room includes a ceiling fan and warm caramelized wooden furnishings to enhance each corner. Walking through to the dining area, the space doubles. The high-rise ceilings are extravagant and create an ambiance of sophistication. 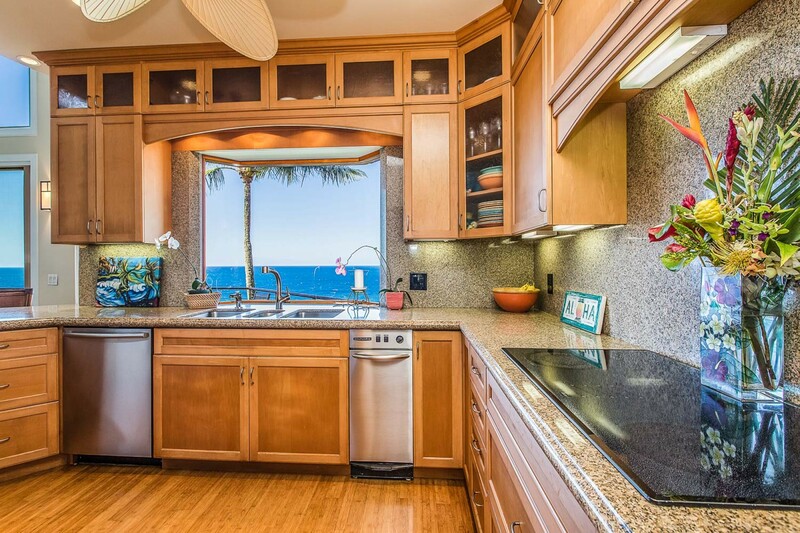 The dining area can seat up to six guest and the island counter of the adjoining kitchen seats an additional two guests. 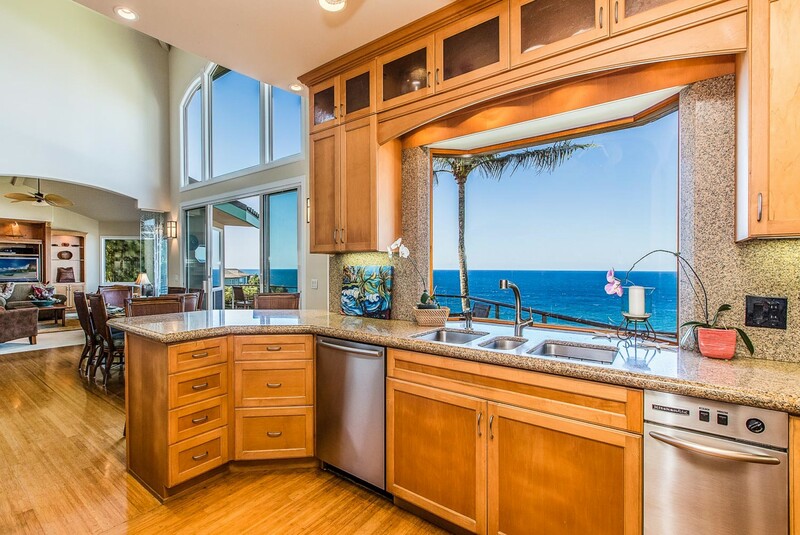 The kitchen comes fully equipped and ready to use. 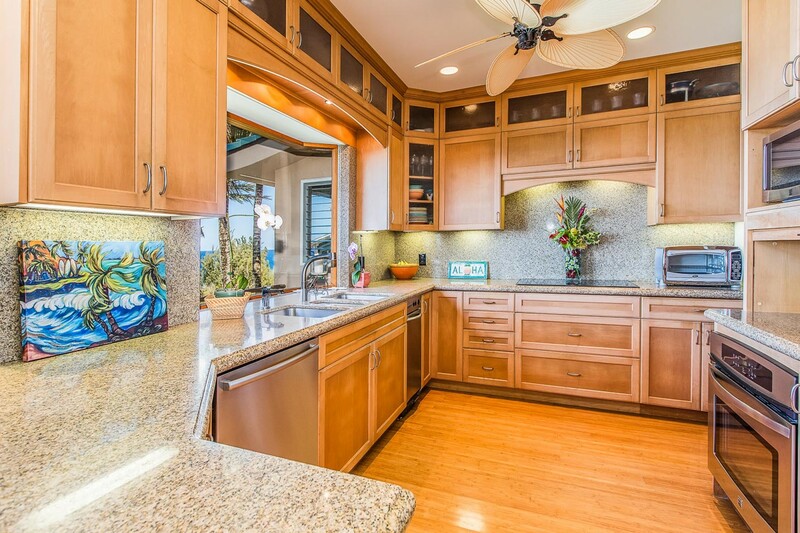 The marbleize countertops and luxurious amenities are in pristine condition. 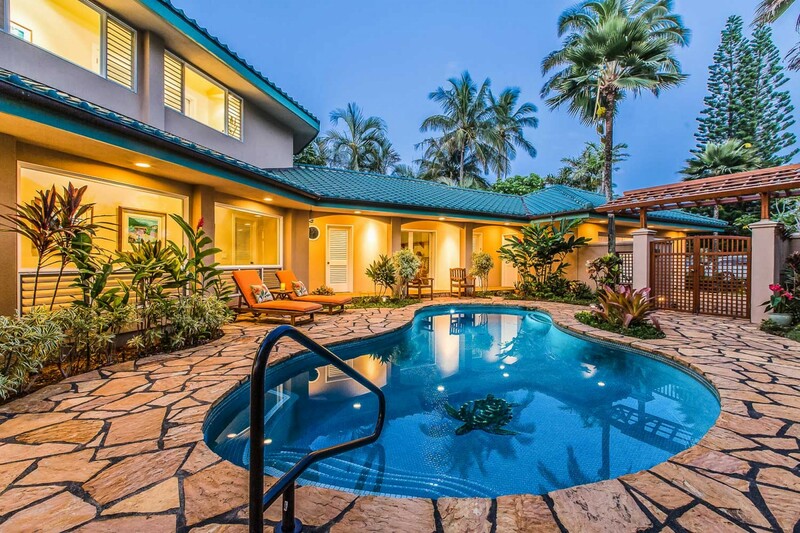 This stunning villa boasts four luxurious bedrooms in total. 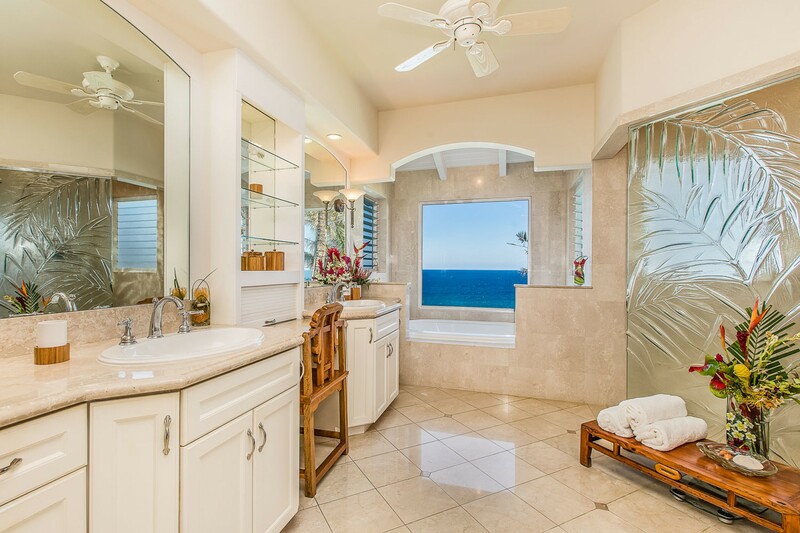 Three of the bedrooms offers captivating ocean-views and all have their own en-suite bathrooms. 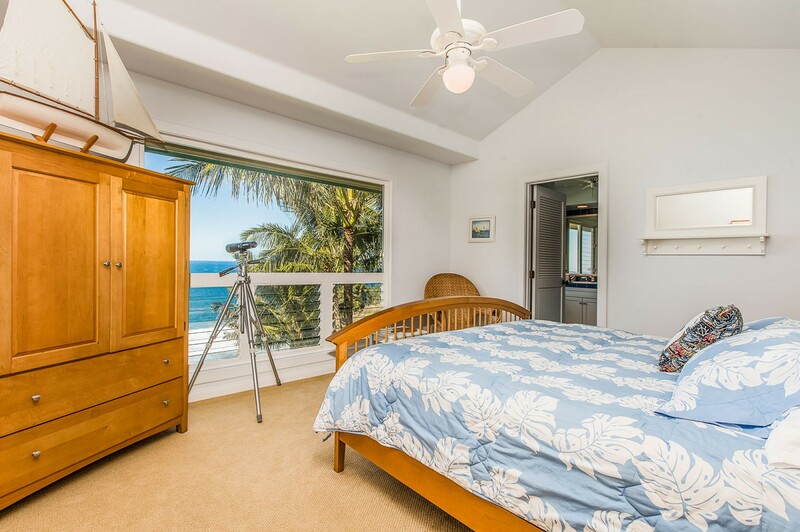 The fourth bedroom just steps away from the pool, also has its own bathroom. 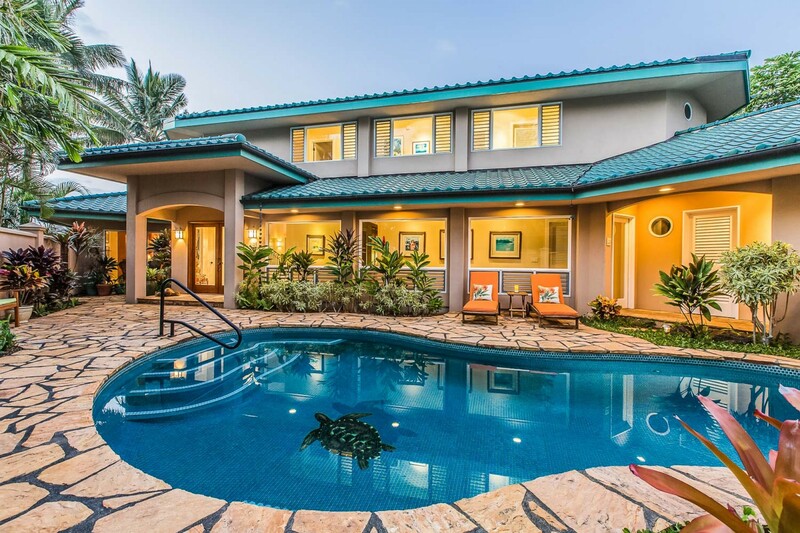 The home features split air conditioning systems into two bedrooms on the second level and one bedroom by the courtyard/pool area. 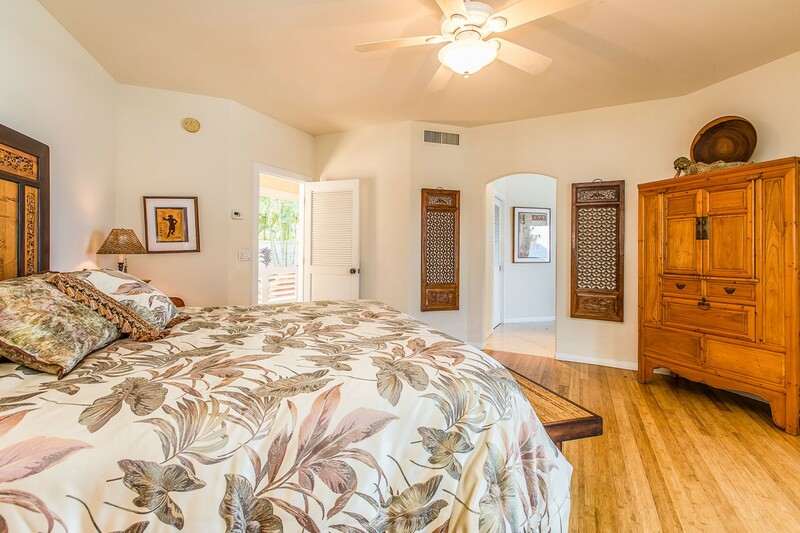 The master suite and living area feature central air conditioning. 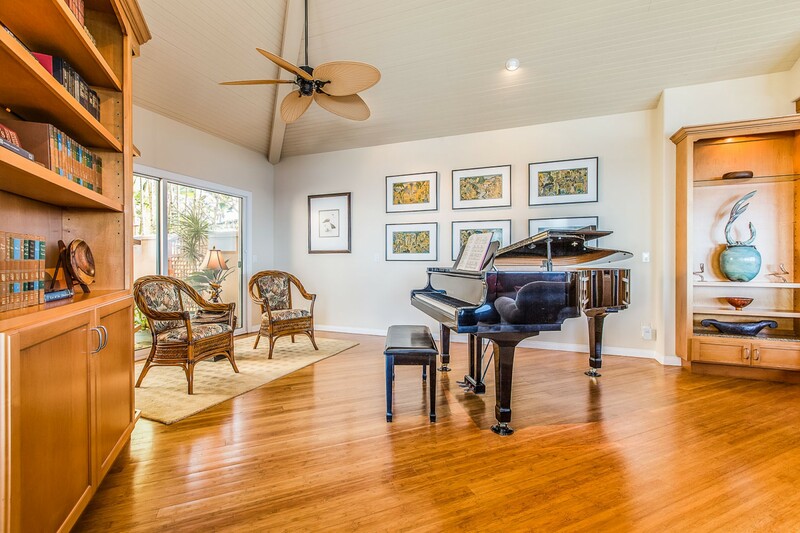 The villa also has its own beautiful piano, so you can practice your musical skills during your tranquil stay here. Honu Awa is embedded in the tropical area of Princeville, in Kauai, Hawaii. 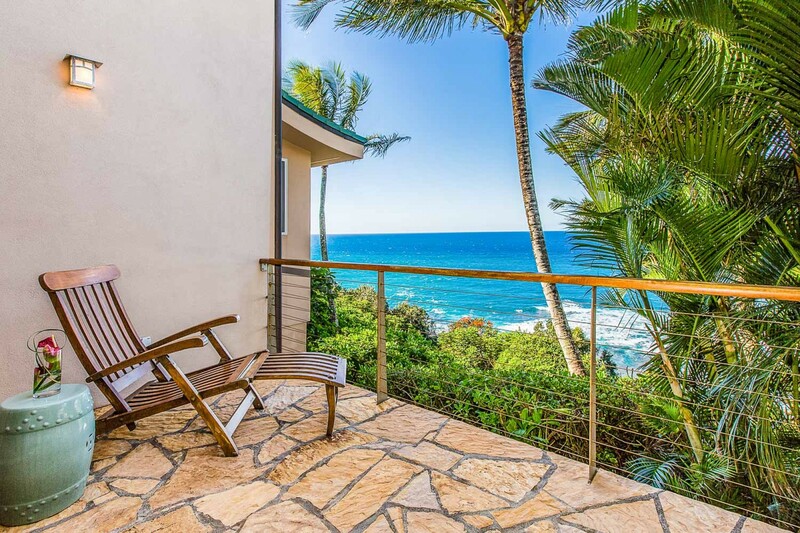 The villa is located along the serene north shore of Kauai, overlooking the north shore surf, a mesmerizing reef, and the panoramic, endless Pacific waters. 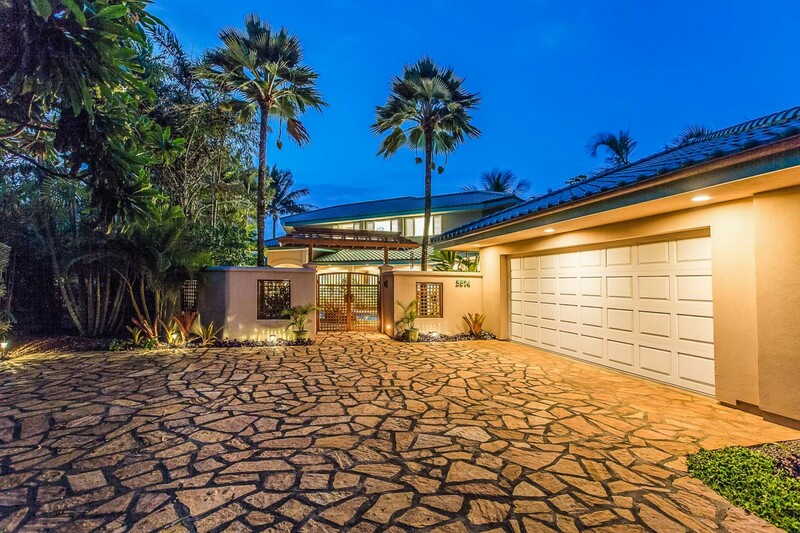 This luxurious space offers unparalleled beauty and elegance in a modern tropical setting. 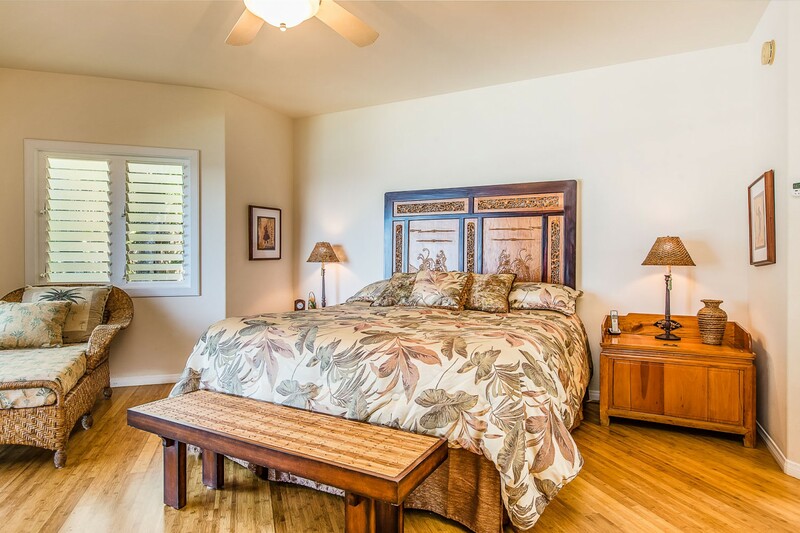 Honu Awa is ideally located, nestled in the secluded area of Kauai, yet also being based near many local amenities. 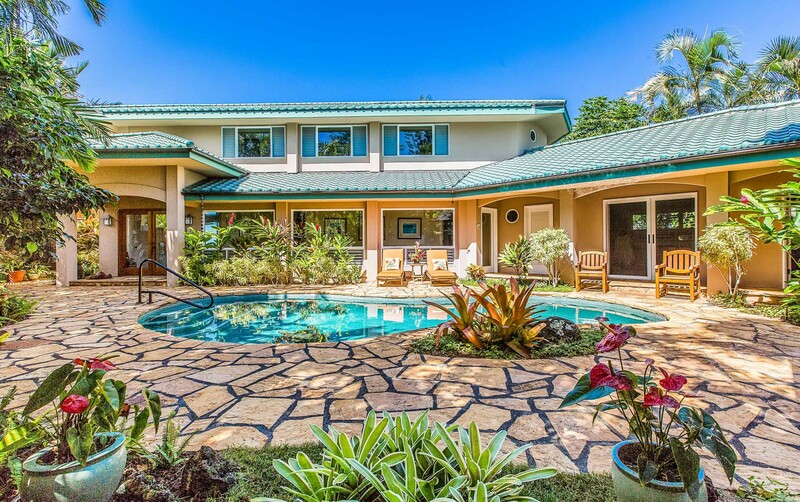 The Lihue Airport is an hour’s drive from Honu Awa. 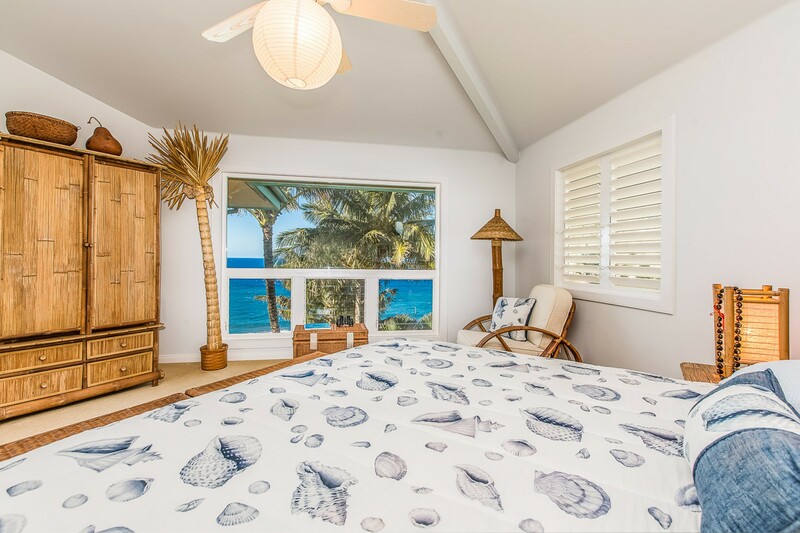 Just steps away from your secluded villa, you will discover a convenient access to the renowned Hanalei Bay and just a short drive away you will also find breathtaking beaches like Lumahai and Anini. 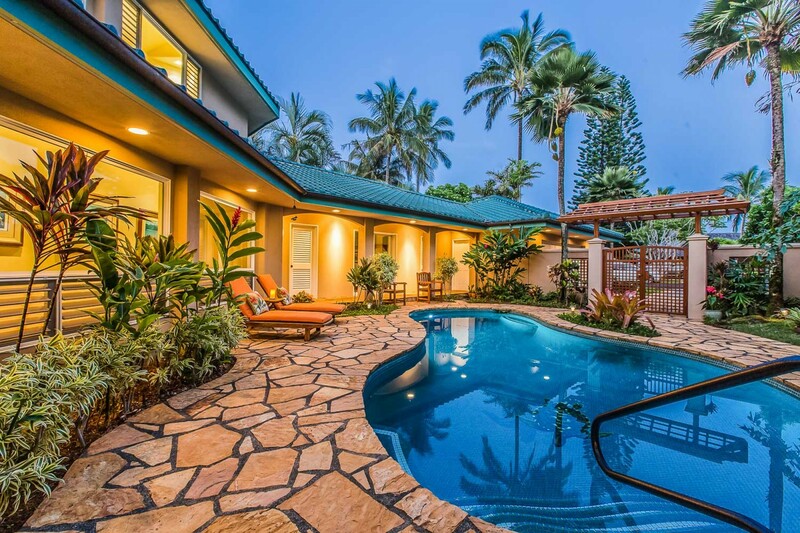 The villa is a short drive to the Princeville shopping center. 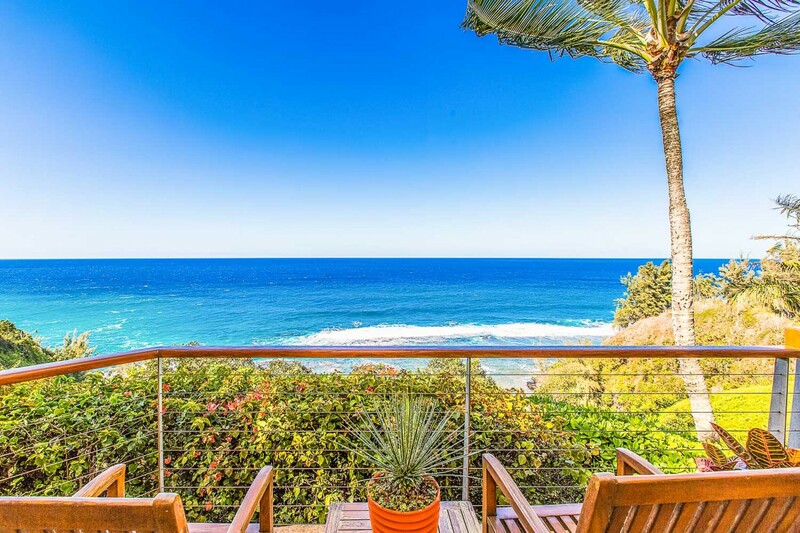 If you want to venture a little further then take a drive to the quaint bordering town of Hanalei, which has a profusion of vibrant coffee shops, delicious groceries, fine dining restaurants, local shops, bars and of course world class white sandy beaches. Hanalei Beach is the perfect place to spend a day under the warm sun and overlooking the glistening turquoise waters. 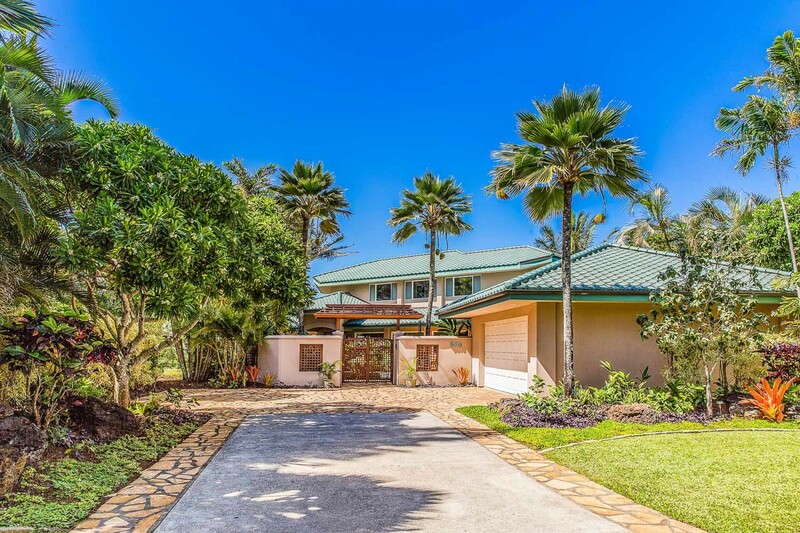 The villa is also a short drive from the Makai Golf Club. There are many leisurely attractions for you to take part in such as horseback riding, surfing, kayaking, snorkeling, helicopter tours and boat tours. 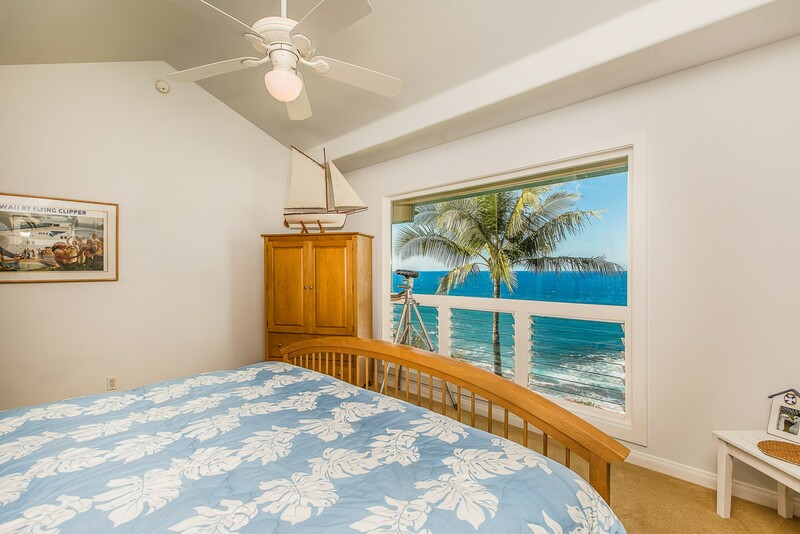 Bedroom 1 Master: The Hawaiian Suite, Master King-sized bed, Private en-suite bathroom, Standalone Shower, Closet, Ceiling Fan, High-Resolution Television, Upstairs Ocean Views. 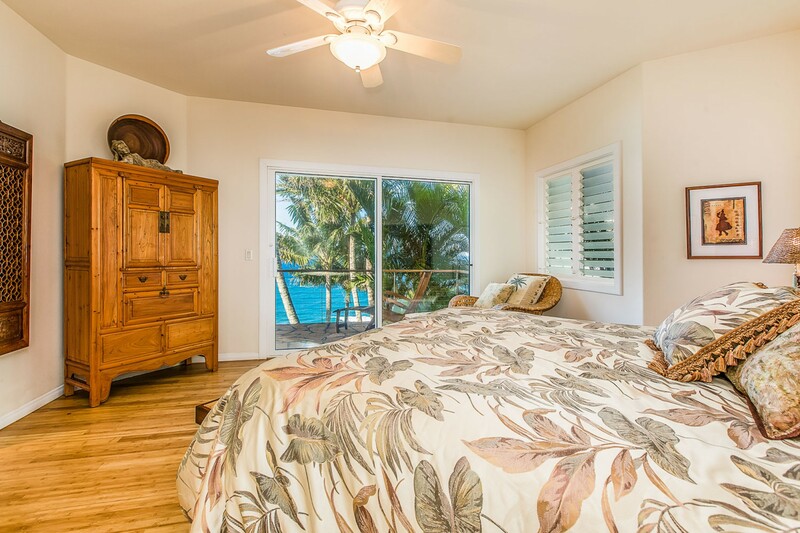 Bedroom 2: The Aloha Suite, luxurious King-sized bed, Private en-suite bathroom, Standalone Shower, Bathtub, Closet, Ceiling Fan, High-Resolution Television, Upstairs Ocean Views. Bedroom 4: The Pool Suite, King-sized bed, En-suite bathroom, Standalone Shower, High Resolution Television.